Angry Birds Go! 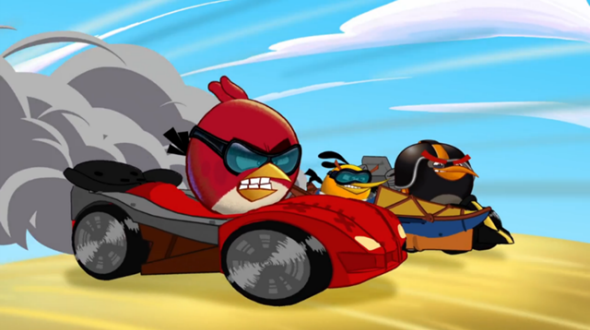 - a kart racer from Rovio - has got the new trailer and the official release date today. Moreover, the developers have finally shown the gameplay of the future project and revealed some its exciting details. Angry Birds Go! was announced several months ago, but until today there were not much information about this upcoming game. Now we have the new gameplay trailer, which demonstrates some interesting racer's features. Thus, unlike the previous projects of the studio the game will be three-dimensional and look like the classical console kart racer. You will be able to choose the driver and its car, upgrade your often ridiculous automobile and get a lot of different super powers and abilities. To see how it all will work, watch the newly released Angry Birds Go! trailer, which appeared on the official Rovio's channel a couple of hours ago. Also it became known that Angry Birds Go! release date is scheduled for the 11th of December. Are you going to wait for this day or this game is not your cup of tea? Write your opinion in the comments below.